Born and raised on the west side of Cleveland, graduated from St Edward High School. Worked for Brookside Excavating in Olmsted Township during and after high school. 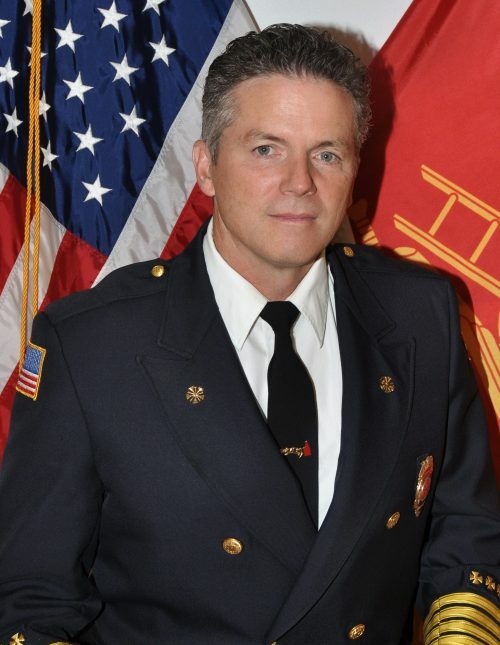 Hired in the Cleveland Fire Department in March 1982; promoted to Lieutenant in 1993; Captain in 1997; Battalion Chief in 2001; Assistant Chief in 2007; and Chief in 2013. He served as the Chief of Support Services, Chief of Special Services, Chief of Operations, and Executive Officer; also actively involved in several committees, both departmental and regional. Retired from Cleveland in September 2015 after over 33 years of service. Hired as the Chief of the Olmsted Township Fire Department in September of 2015. Is actively pursuing a degree in Fire Science and Technology; is a State Certified Fire Service Instructor and Inspector; is a Hazardous Materials Technician. Is a graduate of the Ohio Fire Executive Program and the Ohio Fire Chiefs Maxwell Leadership Program. Pat has been married for over 25 years and is the proud father of five children. Enjoys physical activities, the outdoors, reading and spending time with his family. Born in Natchitoches(Nack – a – tish), Louisiana; Chris moved around the US with his family staying in North Carolina long enough to graduate from Davie High School in Davie County. Chris took his first CPR class on the bay floors of the Smith Grove Fire Department. He attended the University of North Carolina, studying business marketing and management before his childhood desires took back over, and joined the fire service. Initially, Chris served as a volunteer with Tuckahoe Rescue and Hanover County Fire and EMS in Virginia. He started his career working for Spotsylvania County Virginia as a Firefighter/Paramedic and logistics officer. He was then hired by the Richmond Fire Department, where he served for ten years as a member of the Rescue 3/Quint 13 crew, and the cities Hazardous Materials team. He graduated from JSR College with a degree in Fire Science, and later the University of Richmond with a degree in Emergency Management. As firefighters are known to have additional jobs… he also worked part time for Richmond Ambulance Authority, MCV Hospitals, Hanover County Fire and EMS and Set Safety Incorporated for many HBO movies and commercial film shoots. Chris moved to Ohio in 2008 and became the Training Coordinator for Hudson EMS. He is married to an incredible Ohio native, and they have a very energetic son together. He is a National Fire Academy Executive Fire Officer Graduate, and will graduate from Kent State University with a Master’s in Public Administration in the spring of 2019. 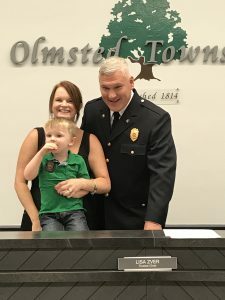 He is looking forward to a future working with Chief Kelly, the firefighters and officers in the OTFD, the Township Administrator and the Olmsted Township Board of Trustees, to continue the departments’ delivery of excellent service to the citizens and visitors in the Olmsted community!